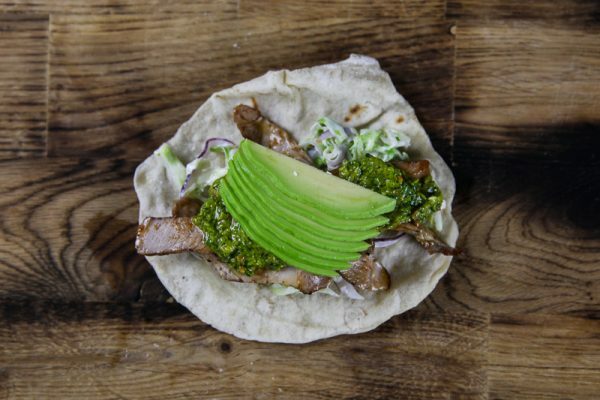 You can never get enough of this great grilled pork taco, grilled pork, a fresh tortilla topped with a creamy yogurt coleslaw, some chimichurri and a few slices of fresh avocado. You won’t regret trying this one out. 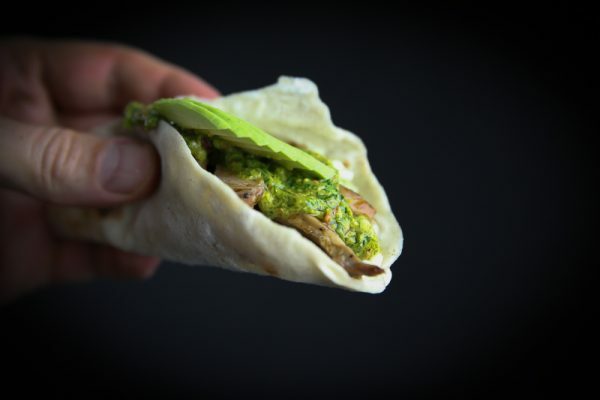 This grilled pork taco is another great one to try. It is actually sort of a greatest hits taco for me. Meaning that most of the toppings have been tested before on other tacos. Both the yogurt coleslaw and the chimichurri is used for some of the other tacos I’ve made before. But for now, let’s stick with this one. Like always I’ll go through what is on the taco first, then there are a few individual recipes for the toppings. 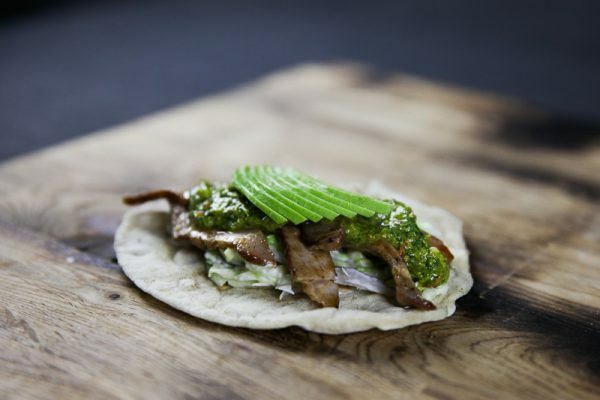 The grilled pork taco is served on a homemade wheat tortilla which is totally worth the effort of making. Get the recipe for that here. No shame if you don’t feel like making your own, there is plenty of tortillas in the store. Now let’s make some tacos. Assemble the taco as in the video below. Start out with the tortilla, heat it in the oven or in a dry frying pan before serving. Top with the coleslaw, meat, chimichurri and finally the avocado. Now let’s talk a bit about the meat for the grilled pork taco. Pork collar is one of my favorite cuts for tacos. 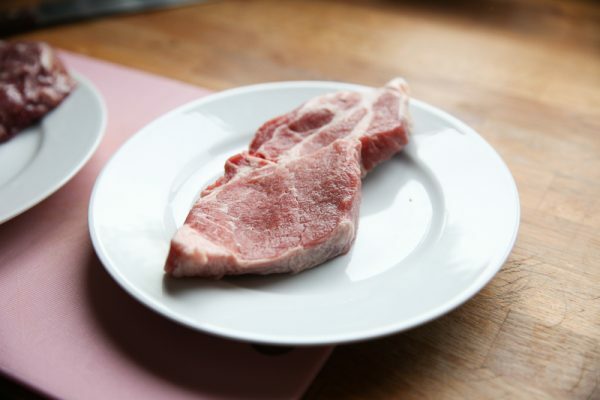 This meat comes at a great value and is often very tender. It has some fat so it rarely gets dry. Since I was just making some tacos I just got one slice. I seasoned it with salt and pepper and simply grilled until cooked through. Then leave the meat to rest. Slice the meat into thin slices and add the BBQ sauce, keep warm. That’s it. You can, of course, use all sorts of meat for tacos with similar flavors as this. But the good thing here is that it’s a quick way to cook things up. I like a whole day BBQ project for tacos as well, maybe even more than this meat but you don’t always have that time to spare. That’s when it’s great to get a slice of pork collar. 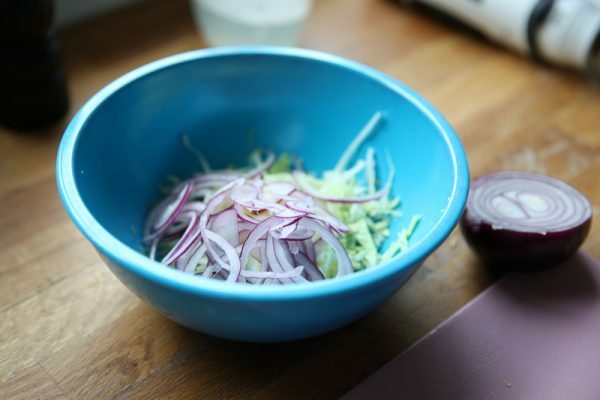 Slice the cabbage as thin as you can. Peel and slice the onion as thin as you can. Combine the salt, pepper, and yogurt in a bowl. Squeeze in a half lemon. Check the flavor and adjust if necessary. 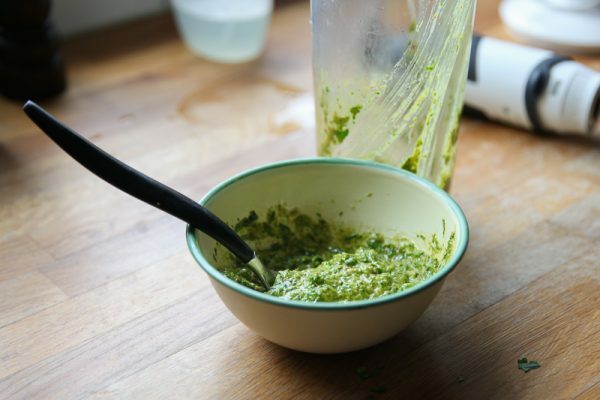 I don’t claim this chimichurri recipe to be authentic in any way. I used more or less what I had at home and it turned out delicious. What I mean by that is that feel free to improvise. Chop the herbs, garlic and chili roughly. Add to a mixer or a cup so you can mix it with a handheld blender. Add the rest of the ingredients. Blend until you have a rough sauce. Season with salt and pepper. 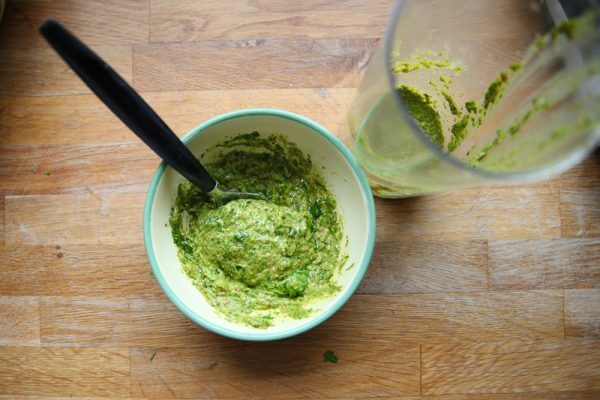 As you most likely already know chimichurri is great with all meats and lots of other stuff too. So if you get some leftover it shouldn’t be a problem. It lasts 2-3 days in the fridge. I love tacos. This means I keep making tacos and eating them and also post them here for everyone who shares this love. I try to step away from the classic tex-mex stuff and creating sort of my own twist on things. 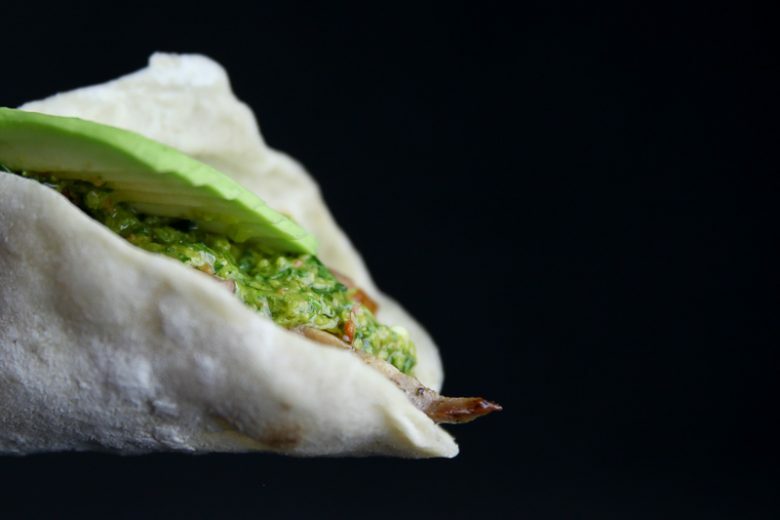 This is not easy in the world of tacos but that is part of the fun. For all my Taco Recipes visit the category taco recipes. You’ll find not just great taco recipes but also great sides, toppings, and sauces.